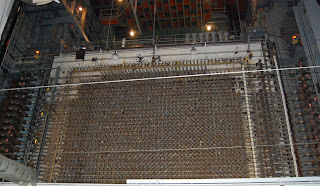 The B reactor at Hanford was the first industrial-scale nuclear reactor. It was completed in 1944 as the only source for creating plutonium for the Manhattan Project. The plutonium created here was used for the Trinity Test and then Fat Man, ending WWII. The tour yesterday was fantastic. It would have been very easy to stray from the group, but with a map labeling the various radiation hazards of non-public areas, it would not have been prudent.